William Osborne Minerd was born on Nov. 15, 1866 at Bridgeport, near Mt. Pleasant, Westmoreland County, PA, the son of Eli and Mary Ann (Baer) Minerd. Sadly, he is one of many of our cousins to have been killed in railroad or trolley accidents over the years. He is seen here in a faded photograph, standing at left, with his brother Rev. 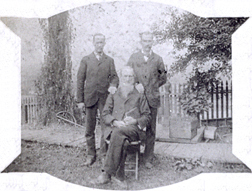 Isaac Herschel Minerd (standing, right) and and aged father Eli (seated). William never married, and was employed for years as a flagman for the Baltimore and Ohio Railroad at Connellsville, Fayette County, PA. He was a member of the Connellsville local of the Brotherhood of Railroad Trainmen, an early union. Circa 1899, his dues were 25 cents every pay period. He made his residence in Connellsville, which was the bustling hub of the coal and coke industry for many years. The ample supply of high grade coal products converted into coking fuel resulted in a steady stream of rail shipments to the steel mills of Pittsburgh, some 50 miles to the northwest. On Jan. 3, 1906, the Grim Reaper struck when the 40-year-old William was killed in a grisly accident while at work in the busy yards of the B&O in Connellsville. in the Local Yards at an Early Hour This Morning. Further investigation, said the Greensburg Daily Tribune, showed William slipped on a tie while making a coupling, "and fell under the train, the wheels of four cars passing over him at the hip." William's elderly father had to travel to Connellsville and to endure the horrific task of identifying the mangled corpse. Compounding the horror was that the deceased recently had let his life insurance lapse, meaning no compensation was available for the loss. He is buried beside his parents at the Alverton Cemetery near Mt. Pleasant. Click to see the full list of Minerd-Minard-Miner-Minor cousins who have lost their lives in railroad and streetcar accidents.